Trade ministries, just as other parts of government, need to respond to calls from the public and from global leaders for action on major issues. This column argues that armed with potential policy options identified through the E15Initiative, the WTO is equipped to contribute to solutions in many areas. Purposeful efforts over the coming months and years could help to boost the WTO’s essential and valuable place in ensuring a responsive and inclusive furtherance of globalisation and trade and investment integration that delivers sustainable development outcomes for all. WTO members are facing a summer break that is both familiar but also new and unexpected. They now face the choice between locking down a third pattern-affirming cycle of negotiations that at previous trade ministers’ summits in Bali and Nairobi in 2013 and 2015 delivered substantive if not spectacular outcomes; or reaching further to reframe the WTO’s role governing over world trade as its frameworks face multiple existential challenges. The WTO’s eleventh ministerial conference to be held end-2017 offers a historic opportunity to deliver impressive results to reassert the WTO’s critical relevance to priorities from growth, to poverty eradication and inclusion, to low carbon development. 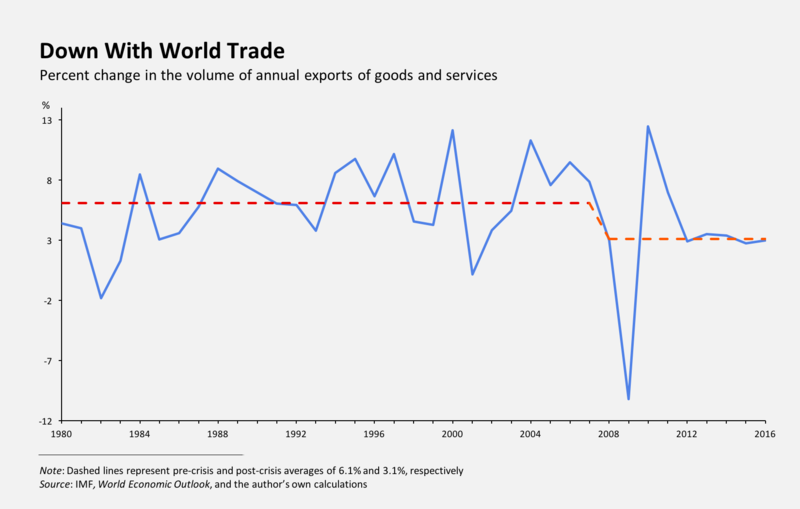 The political context provides the opportunity to continue to relieve what was previously a period of relative drought in multilateral trade decision-making. The clinching of the Trade Facilitation Agreement in Bali opened a new way of negotiating commitments that applied to all WTO members at different levels and with accompanying support. Last year’s Nairobi package delivered real progress on a number of long-standing issues, but importantly it also marked a point at which countries agreed to disagree on continuing pursuit of the Doha negotiating framework, while expressing a firm commitment to tackling its outstanding items. Although members also agreed not to launch multilateral negotiations on other items unless by consensus, discussions have started on a range of areas and future possibilities, a move loudly endorsed by the G20 trade ministers in early July of this year. This dynamic reflects both a changed trade environment and also new contexts in which preferential agreements like the Comprehensive Economic and Trade Agreement between the EU and Canada, and the Trans-Pacific Partnership engaging 12 countries and 24 percent of global merchandise trade, have jumped ahead of the WTO. Both arrangements constitute the 21st century yardstick for regulatory coherence and substantive coverage for integration of national economies into global markets. At this time, however, a popular backlash against globalisation policies, riding on mediocre growth in key involved economies, looms large on the horizon with the potential to undo these integration efforts. These developments leave trade officials in the Northern summer heat facing what is admittedly a daunting task of agreeing on any deal, while also recognising that the WTO’s institutional centrality will not be fully regained with piecemeal agreements. Critically, it is not a lack of ideas that constrains the multilateral trade system from moving forward more assertively, even if further scrutiny of the economic and distributive effects of current arrangements continues to be paramount. Indeed, over the last three years close to 400 of the world’s top experts, in collaboration with leading institutions within the E15Initiative process – convened by the International Centre for Trade and Sustainable Development and the World Economic Forum – have focused on some of the tough questions facing the future of the global trading system and identified potential policy options . The initiative also created a fresh space to articulate some WTO-specific proposals that had previously found limited room to air within the Doha gridlock. Armed with these, the politics of the moment and the richness of their deliberations and collective reflections in the past six months, WTO members are now in a unique spot to move forward over both the short and long term. In an exceptional manner, the Nairobi outcome offers a license to reframe cooperative approaches and rule-making at the WTO. Reframing would involve not only identifying different ways to achieve Doha issues, but also acting on the most pressing aspects of these today. Moving towards the forthcoming ministerial, a step-wise approach could be used whereby members consider the direction of travel as well as specific actions for the present. As WTO members prepare for a General Council meeting at the end of July, the following options may prove useful food for thought for the summer pause and the resumption of talks at the rentrée in September. The new Sustainable Development Goals and the universally adopted Agenda 2030 urge broader attention to measures supportive of trade by the world’s poor and poorest countries. E15 papers have articulated a need for WTO members to develop a comprehensive approach addressing constraints on trade finance, services, and investment facilitation, among other areas, in response to challenges arising in a post-crisis world. The next ministerial meeting could launch a framework on trade facilitation in services, for example, considering the potential contribution of services trade to the GDP of low-income countries. Boosting services trade may also have important gender equality impacts, given that half of global female employment is in services. In complement, much reflection is currently taking place in Geneva and elsewhere on the subject of maximising the multi-faceted opportunities of the internet for trade, including for inclusion. E-commerce is not a new issue to the WTO, but although some aspects of digital trade are within the scope of WTO rules, coverage is more limited in others such as cross-border data flows. Recognising the increasing importance of the digital economy and related flows for trade, growth, and development, the transformation of the current e-commerce work programme into an ambitious mandate for a digital trade agreement – plurilateral or otherwise – could be a long-term goal that builds from domestic and regional innovations in the interim. As a first step, however, WTO members need to concretely identify what would be suitable to address in the short term and what will need further analysis. To help with this, the E15Initiative has recommended convening a working group to better understand the scope for WTO law to support digital trade, and/or establishing a platform in the WTO to receive inputs from external experts on the digital economy and its relationship with the international trade system. In recognition of the realities of complex investment-led global value chains , discussions on trade and investment coherence could be enhanced multilaterally, following an acceleration of interest among G20 trade ministers in this area. One such avenue would be to reactivate the WTO Working Group on the Relationship between Trade and Investment, as noted by G20 trade ministers. Where countries put in place strong enabling environments including around infrastructure, education, enterprise development, and so on, value chains – both regional and international – can offer opportunities for economic upgrading and diversification critical for growth and development in various ways in low-, middle-, and high-income economies. Whether the WTO is able to support this 21st century trade – identified by Richard Baldwin as a “trade-investment-services-IP nexus” – and the transformative potential it holds will depend on its ability to conceive or update deeper disciplines with supply chain mechanics in mind. Too many low- and middle-income countries face being left on the sidelines – for the moment – of mega-regional deals. For this reason and others, it is a well-versed reality that the WTO needs to contend with the wider trade and investment architecture to initiate a momentum to pave the way for a more coherent, all-embracing global trade regime. More work on the WTO’s relationship with the wider architecture – starting with the transformation into permanent of the provisional Transparency Mechanism looking into regional trade agreements – should forge ahead. An independent platform proposed by the E15Initiative to support such scrutiny in a systematic manner is being established by a consortium of think tanks and regional development banks, called the RTA Exchange initiative. Going forward, into 2025 and beyond, the WTO will do well to gradually harvest best practice from regional trade agreements , and to establish itself as catalyst for coherence of the global trade regime. The Doha Agenda and subsequent ministerial declarations called for work on a prohibition of certain forms of fisheries subsidies that contribute to overcapacity and overfishing. A continued pursuit of a multilateral outcome on fisheries subsidies disciplines could work based on areas of relative agreement. One such area is the prohibitions on subsidies provided to overfished stocks and to illegal, unregulated, and unreported activities, as proposed by several WTO members last year. Another option would be to adopt such disciplines among a core group of countries, in other words, a fisheries subsidies plurilateral. The idea is already reflected regionally in the signed, but not yet ratified Trans-Pacific Partnership. Incentives to join by unenthusiastic members are more limited in the WTO plurilateral context compared to the regional trade agreements dynamic, with the perennial free-riding risk, but the time to be creative is now. A willing group moving forward in some form would represent an important contribution to ocean sustainability efforts if the multilateral outcome remains unattainable in the immediate future. Such an attempt should also result in innovation on defining critical mass thresholds for rule-making, particularly on effective frameworks for the stewardship of natural resources. Further, if the overarching goal is ocean sustainability , consideration should be given to other supportive trade tools, drawing on leaps in evidence and analysis over the last 15 years. It seems inexcusable, for example, not to also pursue additional measures through the trade system that help to close the market to illegal fish catch. Although there is still a way to go and experience to be gained with some relevant efforts underway, could the WTO eventually capture elements of best practice from the unilateral and regional efforts in a voluntary code on illegal fish imports and transhipment? The Nairobi ministerial established clearer disciplines on agricultural export subsidies and other export competition elements, among other farm trade outcomes. The deal on export subsidies goes some way towards satisfying a target on correcting and preventing distortions in world agriculture. This is slated as a means to achieve an ambitious goal on ending hunger by 2030. Distortions in world agriculture markets, however, are also affected by other factors such as agricultural domestic support or export restrictions, needing focused attention to avoid repeating episodes of price spikes and perverse starve-thy-neighbour, knee-jerk responses. In this context, at a time of new market dynamics arising amid warnings of more frequent climate-related extreme weather events, demographic and resource pressures from land to water growing, and diverse business models evolving, policymakers should think big . WTO members could already start focusing on value chains relevant trade, in particular in agriculture products or goods critical to ensuring food and nutrition security (e.g. seeds, pesticides, fertilisers), as well as identifying services, market distortions, transport and logistics, standards, labels, barriers to the adoption of productivity-enhancing technologies, competition concerns, and intellectual property issues that may be addressed as a package that responds to the reality of food systems in today’s global economy though the multilateral trade system. That said, no outcome on agriculture would be evolutionary unless current problematic subsidies to grain production are tackled. A big chunk of domestic support practices proven to be perverse to ensuring sustainable food production systems have so far eluded effective disciplines since multilateral attempts started over 30 years ago. A reframing approach, combined with confidence-building measures pointing to a gradual transition in traditional and non-traditional providers of subsidies, may offer elements for a WTO package in this area. In complement, talks on a Special Safeguard Mechanism that allows a balance between farmers’ incomes and access to global food supplies will need to find a middle ground solution supportive of both regular trade growth and measures to protect producers during emergencies. A similar innovative approach could be envisioned in support of the Paris Agreement on Climate Change and its imperative for a rapid transition to a low-carbon economy through a massive scale-up of clean energy. The International Centre for Trade and Sustainable Development has long championed the idea of a comprehensive effort to address tariff and non-tariff barriers related to value chains in clean energy technology . Current plurilateral negotiations towards an Environmental Goods Agreement within the WTO offer a partial response to market hindrances. But much more remains, including agreeing on ways forward on associated and embedded services, and the adequate frameworks for the use of anti-dumping, local content requirements, and subsidies. In connection with this, the WTO is perfectly positioned to discipline and phase out fossil fuel production and consumption subsidies, as the only international body with a binding subsidies framework. More broadly, a comprehensive horizontal rethink on subsidies disciplines across goods, agriculture, and even the addition of services would start by evaluating and measuring impact on both third parties and the global commons. This could be combined with a new safe harbour for subsidies with a wider reach, particularly those needed to address market failures or create public goods. A way into this could be to agree to reinstate a modified version of Article 8 of the Agreement on Subsidies and Countervailing Measures concerning Non-Actionable Subsidies that expired in 2000. A working group with a mandate to explore existing and potential enhanced coverage of fossil fuel subsidy reform could be also explored. The above options speak to some of the emerging signs over the past few months in WTO economies. Other areas also remain critical. These include, for example, the implementation of decisions taken in Nairobi related to least developed countries. Special and differential treatment – already partially reconsidered in the Trade Facilitation Agreement – has been a thorny issue that deserves out-of-the box efforts such as treatment defined by multiple indicators on specific sectoral, geographic or resource-defined situations rather than anachronistic aggregate measures reflected in country groupings. On the whole – and evident just from putting pen to paper for this column – it is undeniable that WTO negotiators face no easy task; charged with irrelevance by some voices, navigating general backlash to globalisation and integration, and without an agreed path forward. Even small steps, however, if they are sustained, significant, and constructive, can pave the way towards broader, ambitious visions. A range of ideas were formulated by the E15Initiative, some of which can be slotted directly into existing WTO work, and others that will need to be taken forward through further discussion before eventual decisions to initiate negotiations. The perfect moment has come to think on a grand scale, to consider a variety of modes of engagement from hard law trade deals to softer, cooperative approaches. The formats chosen , whether multilateral, plurilateral, plurilateral with eventual multilaterisation, or hybrid, as well as strengthening the role of WTO committees, should be based on what works. WTO members have in recent history shown themselves capable of adapting form to content. Trade ministries, just as other parts of government, need to respond to calls from the public and global leaders for action on major issues. In many areas the WTO is equipped to contribute to solutions. Purposeful effort over the coming months and years could help to boost the WTO’s essential and valuable place in ensuring a responsive and inclusive furtherance of globalisation and trade and investment integration that delivers sustainable development outcomes for all. This content was originally published on 26 July 2016 on VoxEU , the Centre for Economic Policy Research (CEPR) Policy Portal.